Home » Uncategorized » UH Mānoa » Check out my exciting Surfing Literature and Creative Writing course at UH Mānoa for Spring 2019! 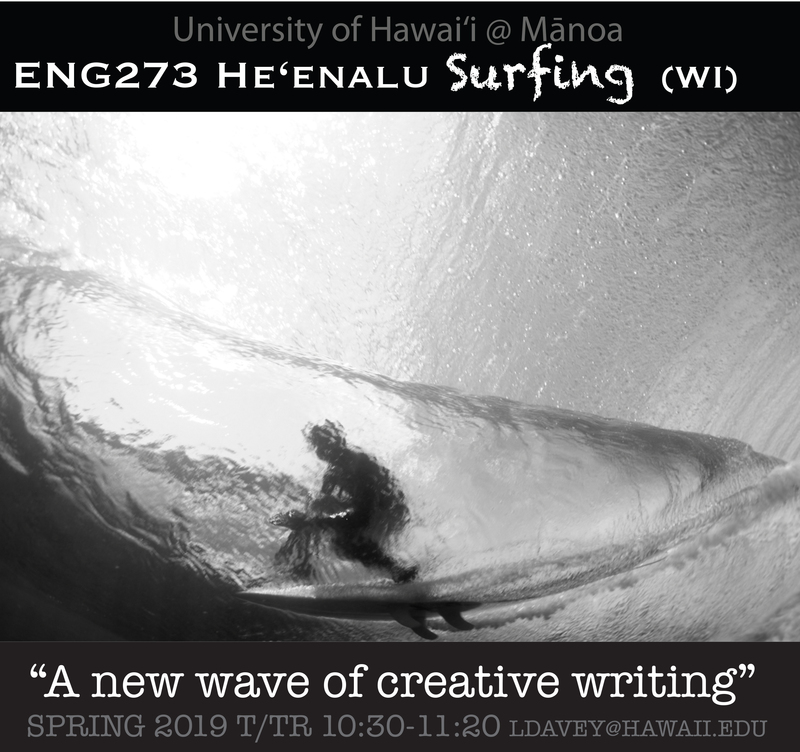 Check out my exciting Surfing Literature and Creative Writing course at UH Mānoa for Spring 2019! Check out my new creative writing course that will be offered at the University of Hawai‘i at Mānoa for the Spring 2019 semester! Course Description: In this course, we will review a collection of traditional Hawaiian surfing mo‘olelo in conjunction with contemporary surf literature comprised from films, documentaries, contests, museums, books, galleries, magazines, websites, and social media to consider how each of these venues connect and interact with the ocean. We will draw comparisons across this archive of surfing literature to establish elements of creative writing that can be found in journalism, biography, poetry, chant, lyrics, short story, photography, videography, and forms of new media. Students will be challenged to consider if the practice of surfing or other ocean related activities can serve as a form of creative writing and they will be encouraged to implement performance related artforms into their assignments or projects. In this context, reading may refer to the way a surfer interprets the ocean prior to paddling out and literature might represent the skills, composition, and styles that a surfer chooses to respond and interact with the waves. If studentsʻ schedules permit, we may meet at designated surf zones to provide a more appropriate platform for our research. Previous post Aloha Eloah (Dear God), Coming to terms with Trump Christianity. Manini already out here, looks like town might have some on the cam?